Membership is free and open to everyone over 16 in Totnes and the surrounding area. 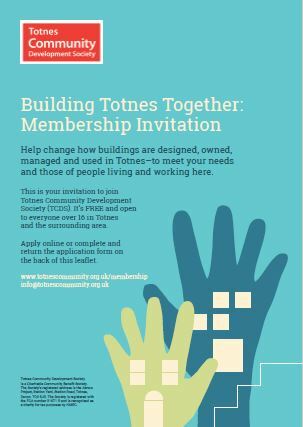 Become a member and help change how buildings are designed, owned, managed and used in Totnes – to meet your needs and those of the people of Totnes. TCDS was set-up as a membership organisation so that it will always be democratically controlled with each member getting an equal vote. As the potential and impact of the work of TCDS grows the membership needs to grow too. In becoming a member you’ll be given a £1 Membership share, for which TCDS will cover the cost. Membership shares cannot be withdrawn so if you terminate your membership, the share will be cancelled and the £1 retained by TCDS. As a member you’ll have a vote at general meetings, on a one-member one-vote basis, for example, Directors are elected from the membership. Members agree to be bound by the Rules of TCDS, which can be downloaded here. This includes a responsibility to participate in general meetings and take an active interest in the activities of Totnes Community Development Society. Members can only have one membership share but there will be opportunities to invest in TCDS in the future. Download more information about membership and an application form. Answers to some frequently asked questions about membership can be seen here.